The epitome of dining table elegance, our Queen Anne Single Pedestal Table is the at-once practical, stunning choice for everyday meals and special occasions. Available in a variety of tabletop styles, sizes, and edges, customize to your heart's content this classic Queen Anne piece. This popular furniture style is named after Queen Anne of England, who reigned from 1702-1714. 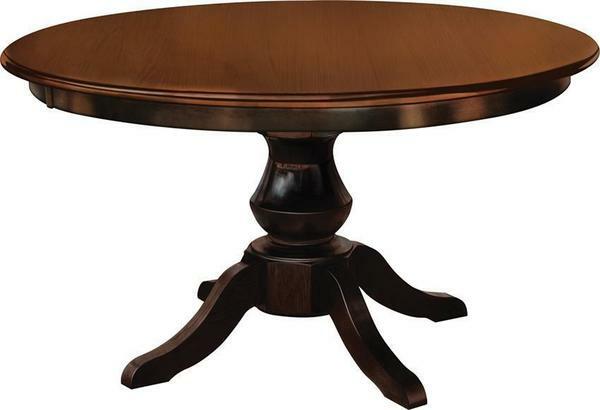 See a modern version of the cabriole leg, common in Queen Anne style pieces, in this single pedestal beauty. Cabriole legs increase the stability of a piece and reduce the amount of underbracing needed. 9 different sizes available, ranging from 36" x 36" to 72" x 72"
Standard 1" tabletop thickness can be ordered at 1-1/4"
Wood and finish of your choice! Kevin delivered my new table yesterday and all three leaves match the table top! I thank you very much for correcting the problem. I really appreciate your help and the fact that Dutch Crafters stood behind their product. I'm sure I'll enjoy the table for many years.